Lake Norman has become one of Charlotte's favorite recreational spots, whether you're on the water or the shore. 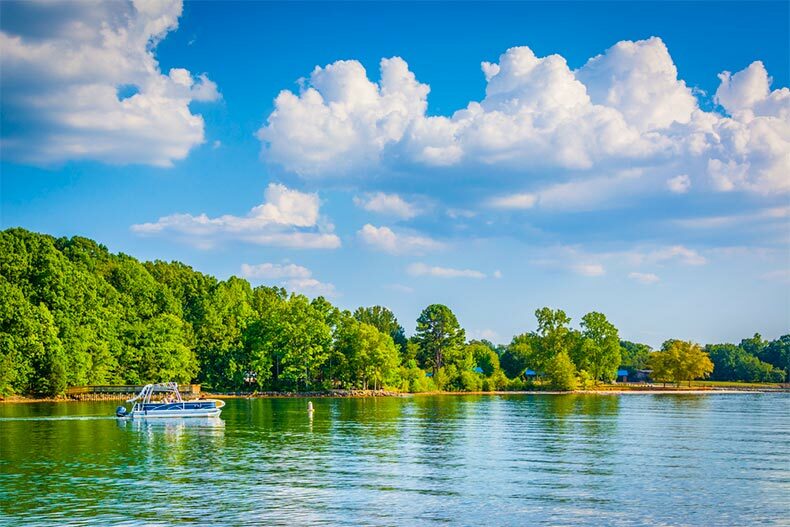 Located just 20 miles from Uptown Charlotte, Lake Norman is one of the most popular recreational lakes in the country. With a shoreline length of over 500 miles, it is the largest manmade lake in the Carolinas. On the shores of Lake Norman are several parks, tennis courts, yacht clubs, and boathouses. It's also surrounded by popular Charlotte-area towns like Cornelius, Davidson, Mooresville, Denver, Troutman, and Huntersville. Created in 1934 by Duke Energy, this 34 mile-long lake and the areas surrounding it offer plenty of shopping, restaurants, fishing and other water activities. Several 55+ communities have noticed the perks of living on Lake Norman, making it a great place to retire. We've rounded up a few of the popular communities on the lake's shore. Located in Denver, just a few minutes outside of Charlotte, Trilogy Lake Norman is a resort-style community that offers nine distinct floor plans ranging from 1,364 to 2,550 square feet, with loft options available as well. The three collections: Creekside, Ridgeline, and Shea, have two or three bedrooms, up to three and a half bathrooms, an attached garage, and a courtyard and covered patio. The centerpiece of this community is the 30,000 square-foot clubhouse, where residents can enjoy the fitness center, indoor lap pool, a catering kitchen, and the on-site Signature Restaurant. Trilogy Lake Norman sits on more than 600 acres and includes an outdoor pool, tennis and pickleball courts, and easy access to Lake Norman. Bailey’s Glen is an active adult community that sits on 145 acres in Cornelius, just 20 minutes north of Charlotte. This community offers 18 different floor plans, and buyers can select paint colors, carpets, and more. This community has 670 homes divided between 545 single-family houses and 125 luxury condos. Bailey’s Glen is an established neighborhood and borders Bailey Park, only a few miles from Lake Norman. Amenities include a clubhouse with an exercise studio, billiards, and a ballroom. This community has a full-time activities director, along with two pools, pickleball and tennis courts, a putting green, and a dog park, among other exciting features. Located in Huntersville near Lake Norman, The Courtyards of Huntersville is a 55+ community with 51 low-maintenance homes. An intimate community of 51 single-family homes that range in size from 1,519 to 3,544 square feet with two or three bedrooms, two or three bathrooms, and attached two-car garages. Amenities include a clubhouse with a fitness center, multi-purpose rooms, an outdoor pool, and a patio. The grounds around the community feature walking trails and a scenic pond. Because The Courtyards on Lake Norman is located on Lake Norman, residents here will have easy access to the area’s most popular recreational lake. Living here means you can boat, kayak, fish, swim and have a cookout right at the lake. This active adult community features 67 attached homes with three models. They range in size from 1,619 to 3,544 square feet and include two or three bedrooms, two or three bathrooms, and two-car garages. Amenities include a clubhouse with a multipurpose room and fitness center, an outdoor pool and patio, as well as walking trails. Located in Mooresville, North Carolina, in close proximity to Lake Norman, this 55+ community is made up of 173 low-maintenance, single-family homes and attached townhomes. All homes in The Villages at Oak Tree have between 1,100 to 1,500 square feet with two bedrooms, two bathrooms, and an attached garage. Amenities include the clubhouse where there is a fitness room, a multi-purpose room, a library, and a catering kitchen. Outdoors, residents can jog or walk on the trail surrounding the community's pond and sidewalks.